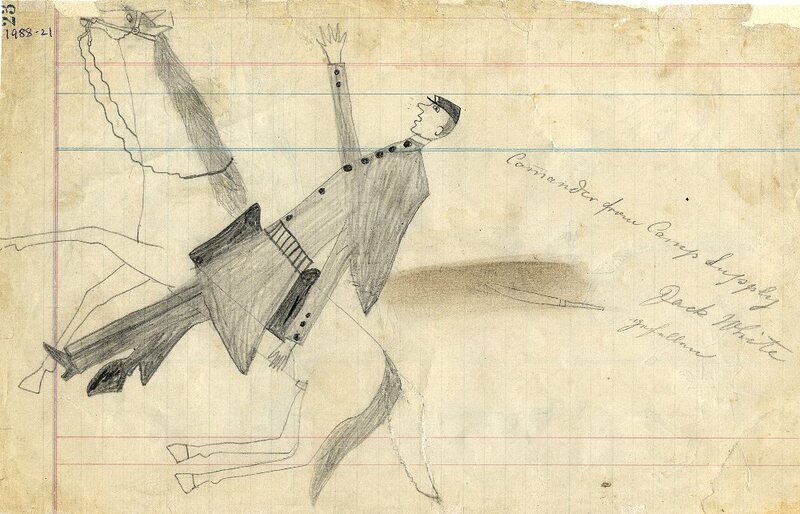 In this unfinished drawing, a U.S. soldier is apparently falling from his horse. The near-vertical position of the horse is seen in other drawings, indicating the animal has been wounded or killed. Note also the slack character of the reins. The drawing bears the inscription in English, “Commander from Camp Supply, Jack White” along with the German word for “dead.” It is unclear whether the knife shown in the drawing relates to the soldier. Camp Supply was a U.S. Army post established in 1868 in Indian Territory, Oklahoma, in support of General Phillip Sheridan’s winter campaign against the Southern Plains Indians. It was from this outpost that George Armstrong Custer led the 7th U.S. Cavalry south to the Washita River to destroy the village of Cheyenne chief Black Kettle, a confrontation later known as the Battle of the Washita. Camp Supply later served to protect the Arapaho and Cheyenne reservations from whites. In 1878, Camp Supply was renamed Fort Supply, after it served a key role during the Red River War of 1874-1875. Correspondence with Fort Sill, tthe National Archives, and numerous state archives in the 1970s and subsequent online research produced no record of White.